The International Court of Justice said that while the two nations did commit crimes against each other during the 1990s Balkan conflict, they did not amount to genocide. The United Nations' International Court of Justice ruled Tuesday that Serbia and Croatia did not commit genocide against each other's people during the 1990s Balkan conflict, the Associated Press reported. Justice Ministers Orsat Miljenic (left) of Croatia and Nikola Selkovic (right) of Serbia attend the verdict in The Hague. A 17-judge panel at the court — the U.N.'s highest and located in The Hague, Netherlands — said that although Serb forces did carry out widespread crimes in Croatia early in the conflict, they did not amount to genocide. The panel also said that a counterclaim based around a 1995 Croatian offensive aimed at winning back territory from Serb rebels featured a number of serious crimes, but also did not reach genocidal proportions. The decision is not unexpected: The U.N.'s Yugoslav war crimes tribunal — a separate court but also based in The Hague — has never charged anyone on either the Serb or Croat side with genocide in the other's territory. Court President Peter Tomka said that, despite multiple crimes being committed during the conflict which led to the breakup of Yugoslavia, the two nations should work together and attempt to achieve lasting reconciliation, AP said. 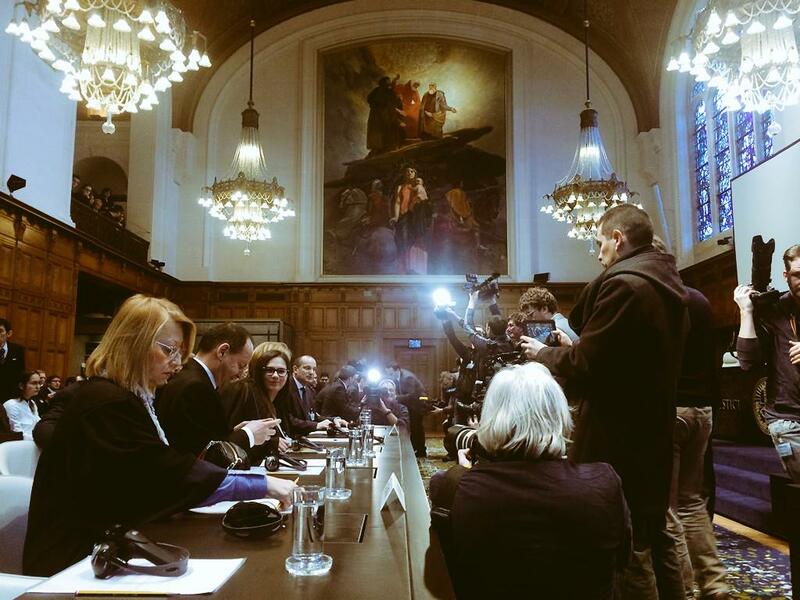 Addressing a packed room at the court's Great Hall of Justice, Tomka said, "The court encourages the parties to continue their cooperation with a view to offering appropriate reparation to the victims of such violations, thus consolidating peace and stability in the region." Speaking prior to the judgement, professor Eric Gordy, an expert from London's School of Slavonic and East European Studies, told NBC News, "What's really at stake is both states trying to justify their wars. The strongest arguments they have to say they are justifying their wars is that they were defending their citizens against genocide." The U.N.'s Yugoslav tribunal had previously ruled that genocide was committed in Bosnia, when 8,000 Bosnian Muslim men and boys were killed when Srebrenica fell to Bosnian Serb forces in 1995, despite the town being a U.N.-designated "safe haven." Recent acquittals of suspects by the Yugoslav tribunal has caused anger in both Croatia and Serbia, NBC News said.